Dentists and lab technicians agree—a gold restoration is ideal for posterior cases, and best for the patient because of gold’s marginal integrity, non-antagonistic properties, biocompatibility, and track record. Dental Masters offers you the unsurpassed accuracy of CAD-milled restorations in noble and high noble gold. 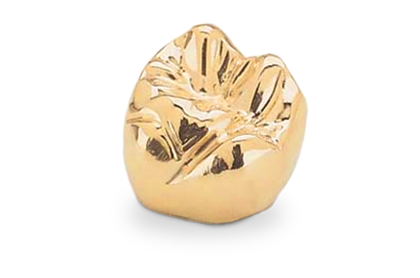 100% CAD designed, our NobleCAD Gold Crowns are milled full contour from a solid block of gold alloy. Zero porosity creates restorations of impeccable margins and exceptional fit. Milling from a porosity-free metal blank also provides a smoothness and density of alloy that is very difficult to match with traditional casting procedures. Plus, our NobleCAD Gold Crowns are certified pure—every restoration comes to you with an IdentAlloy certificate sticker as well as batch tracking to follow that alloy all the way back to its manufacturing process. For crown quality, material purity, and superior value, our NobleCAD Flat-Rate Gold Crowns are the answer. Choose 2% noble or 55% high noble.